Engineers are having problems fully retracting partially collapsed airbags under the Spirit rover's landing platform that may hamper efforts to drive the vehicle straight off and onto the martian surface. Other exit routes are available, however, and mission manager Matt Wallace said he believed Spirit could simply drive over the airbag material with no problems. But mission managers are going to great lengths to ensure the rover's successful egress onto the surface and no one is taking any chances. If scientists are "patient but eager" to begin the rover's scientific exploration, Wallace said, the engineering community wants to be "brave, but not stupid." "We're going to do what we need to do to make sure that we safely get this rover off the vehicle and onto the surface," he said. "This thing is a tremendously capable vehicle. It's a thoroughbred and it's anxious to get out of the starting gate." Jim Bell, designer of Spirit's ultra-sharp Panoramic Camera, said the hundreds of frames needed to complete a 360-degree full-resolution panorama - a major objective of the rover's initial days on Mars - have now been shot. Some of that data already has been beamed back to Earth and the rest should be on the ground in the next few days, thanks in part to the successful resumption of high-gain antenna communications sessions. "Pancam is very healthy, very happily operating and taking lots of pictures on Mars," Bell said. "We had our busiest day yet, by far, yesterday (and) today, taking four more of these mission success octants. In fact, we have now, I'm very happy to say, acquired on board the entire mission success panorama. This is a big achievement and the team is just ecstatic about this." A new segment of the panorama was unveiled today, this one looking behind Spirit to the north. It included a nearby depression, possibly a secondary impact crater, nicknamed Sleepy Hollow. When Sleepy Hollow first appeared in low-resolution navigation cameras earlier in the week, scientists said it would be a candidate for direct inspection once Spirit began surface operations. Yesterday, nearby hills to the south were mentioned as possible high-priority targets. But Sleepy Hollow is not yet out of the running. In the high-resolution pancam images shown today, an 8,000-by-3,000 pixel mosaic, a tantalizing rock face is visible along the rim of the crater that could give scientists a chance to inspect subsurface rock layers. "You can see there's kind of a ridge of rocks going along the backside, there's a rise going up in the back there that's maybe on the order of a meter or so," Bell said. "In the middle (of the crater), that brighter deposit in the middle is kind of peppered with these dark, doughnut-shaped markings. And those might perhaps be marks left by the airbag as it was coming to its final resting place just to the south of Sleepy Hollow." 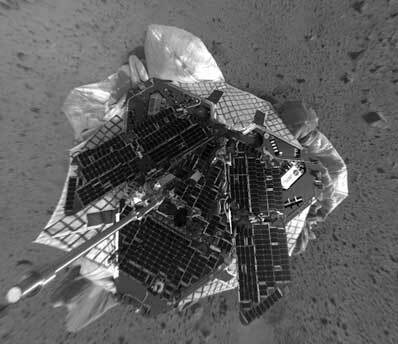 Overnight, Spirit's computer lifted one of its lander petals about 20 degrees and made another attempt to reel in bunched-up airbag material to the front left of the rover. But the so-called "lift and tuck" procedure was not successful. "So we have caucused over the last several hours and have come up with a plan for tomorrow," Wallace said. "What we're going to do is go ahead and retract that airbag an additional six revolutions. We had retracted it three revolutions yesterday so we're going to go ahead and retract another six revolutions and see if that won't pull those airbags down a little bit more. "Independent of the results of that activity, we'll go ahead and drop that petal down so its flat again and we'll move on with our standup activities. If it is successful, then we'll most likely plan an egress of the front of the lander. If it is unsuccessful, then we have several other options, one of which is to turn to the right about 120 degrees and drive down in that direction. We could also turn to the left by about 60 degrees and then back down in roughly the same direction off the lander. "Both those are very viable paths for us," he said. "The lander deck height is not very high relative to the design envelope of the vehicle and the deck is very flat and all the systems are healthy. So we have several options there. We certainly prefer to drive forward if we can, but we have practiced and used very successfully many other direcftions." But first, engineers must stand up the rover on its wheeled undercarriage. Spirit was launched with that undercarriage collapsed and its body latched to the surface of the lander. Early Friday, the computer will use a screw jack built into the lander to push the body upward, allowing the undercarriage to unfold. The rover's two front wheels, folded in against the craft's body during the trip from Earth will be unfolded into their proper positions. The jack then will retract, lowering the body of the rover and allowing undercarriage latches to engage, locking its appendages in their extended positions. "The first piece of this is a critical maneuver where we use a lift mechanism ... to drive the body of the rover up," Wallace said. "And once it's raised up then we will rotate the font wheels out and around and so that they're fully deployed. And we will drop the lander down onto the deck and thereby lock in a number of our mechanism latches. That is the plan for most of the second half of tomorrow. "After we do that, we actually do a second little lift and drop, which is a verification that, in fact, those latches have properly engaged. Assuming that all goes well, we'll be ready to move on and continue with our standup and our egress activities (overnight Friday). As for the airbag problem, Wallace said engineers are still not sure what the problem might be. It's possible the tendons, or cables, running from the retraction spools out to various anchor points on the airbag in question were broken during or immediately after landing. "Depending on how we landed and just how much force is on certain sides of the lander, when we initially started to retract those tendons, even early on, it's conceivable we could have snapped some of those tendons, in which case we'd be unsuccessful, obviously, in retracting those parts of the airbag. That's one possibility. ... It may just be the areas that are puffed up are not attachment points." Data from the lander shows the retraction motors experienced a load and it "appears that we're pulling on something," Wallace said. "But it's possible that part that's puffed up is simply not an area that's attached by a tendon." If the overnight retraction attempt is not successful, engineers will simply press on with standup activities and begin assessing alternate exit routes. "We'll have to wait and see, depending on what direction we decide to go relative to the future activities," Wallace said. "I think the earliest egress looks like about sol-12 (Wednesday) for us. In the event we have to maneuver the petals some more, that could be delayed by two or three days."